Raised on a farm in Central Michigan, Roy Schaefer first started skiing at age two and a half. Growing up skiing on a small rope tow slope set up by a nearby farmer, Schaefer became a racer and instructor. After graduating from West Branch High School in 1957, Schaefer taught skiing at Boyne Mountain and later at Portillo, Chili, rising to the rank of PSIA certified examiner. Returning to Michigan, Schaefer would develop the Lansing Ski Club, installing a new Heron Poma double chairlift in 1970. In addition to running the ski area, Schaefer also raised cattle and was both a middle school teacher and a real estate broker. In 1976, Schaefer's friend Hugh Knapp gave him a heads up about a bankrupt New England ski area called Berkshire East. After seeing its potential, Schaefer moved his family to Western Massachusetts in late August, renting a farmhouse down the road from Chickley Alps ski area. After a successful season operating Berkshire East for the bank, Schaefer looked to purchase the ski area. With Michigan friend Paul Brown's Union Terminal Piers, Schaefer was able to purchase the ski area from the bank. In addition, Union Terminal Piers would also acquire the popular Cannonsburg Ski Area near Grand Rapids, Michigan, with Schaefer overseeing the operation. In redeveloping Berkshire East, two double chairlifts were purchased and installed in the late 1970s. In addition, a nearby gas station and motel were purchased to complement the business. Tough winters hit, however, and the growth of Berkshire East slowed. In the early 1980s, Schaefer leased nearby Berkshire Snow Basin for two seasons. While many ski areas in the region didn't survive the early 1980s, Berkshire East continued with a conservative approach to spending throughout the 1980s and early 1990s. In the meantime, Schaefer would also acquire a motel and a set of rental cottages in Michigan. Beginning in 1994, Berkshire East started to grow. Hundreds of acres of land were purchased and a new beginner complex was developed from the summit of the mountain. After purchasing and selling many of the lifts at the defunct Magic Mountain, Schaefer kept the newest triple chairlift, installing it at Berkshire East in 1995. In addition, using timber from the new trails, the main lodge was dramatically expanded. Around the turn of the century, Schaefer purchased much of the defunct Mt. Tom ski area. While most of the chairlifts were resold, Schaefer kept a smaller chairlift for installation on Berkshire East's Top Notch slope. After the winter of 2002-2003, Schaefer replaced the last original lift at Berkshire East with a quad chairlift from Berthoud Pass, Colorado. Schaefer would sell Berthoud's triple chairlift to Peak Resorts. On July 10, 2007, Schaefer and his oldest son Jim purchased Berkshire East from Union Terminal Piers. In the years following the purchase, Berkshire East has expanded to offer snowtubing and canopy tours. During the 2010-2011 season, Berkshire East installed a wind turbine to provide for all of the ski area's energy needs. 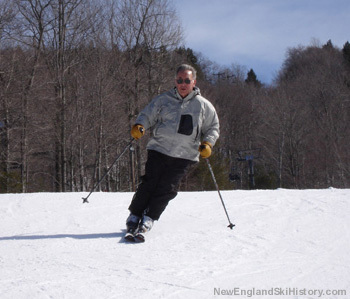 Schaefer and his wife Becky have four sons, who have combined for multiple Massachusetts state ski championships, an NCAA slalom championship, US Development ski team membership, and NCAA Division 1 All American honors. As has been the case for decades, Schaefer can be seen working all over Berkshire East at all hours, including acting as chief parking lot attendant.